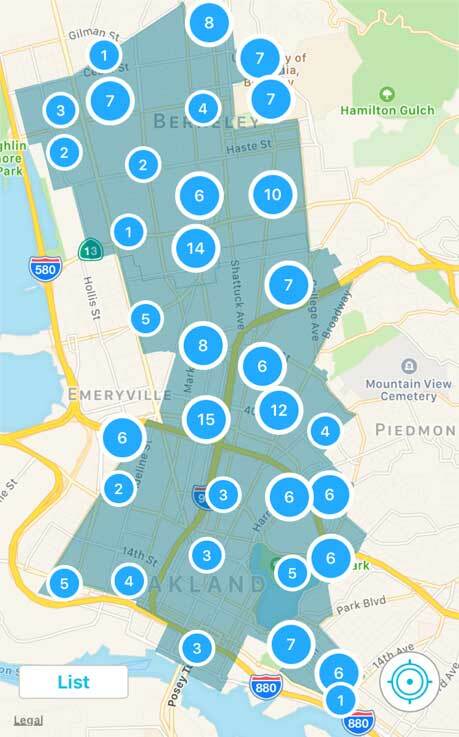 Oakland and Berkeley residents have an exciting new mobility option after the launch of GIG, a one-way car share service by AAA and Ridecell. In April, a fleet of 250 Toyota Prius vehicles was introduced to a “HomeZone” spanning Lake Merritt to North Berkeley. GIG cars come with gas, insurance, and parking at public two-hour spaces are included for all trips. All cars are also equipped with two bike racks. Pricing for GIG is $2.50 per mile, $15 per hour and $85 per day. GIG charges the lowest rate based on how long and how far you drive. Parking during trips costs $0.30 per minute. AAA members receive a 10 percent discount. The minimum charge is $2.50. GIG excels for short trips under an hour, where it is usually cheaper than traditional round-trip car share services (like Zipcar and City Carshare) and with ride-hailing services (like Uber and Lyft). GIG fills a valuable niche as not only a carshare service, but also as a transit extender, with designated parking spots at all BART stations within the service area except 12th and 19th Street stations, and an airport transportation service, with spaces at the Park N’ Fly lot near the Oakland International Airport. For longer trips over an hour, pricing is generally comparable to traditional car share services, and each trip includes up to 250 miles in the price. GIG supports a car-light lifestyle where ownership of one or multiple vehicles per household is not necessary to get around. Initial observations suggest that cars are relatively well used. However, its affordability and convenience could actually induce some new vehicle trips and shift trips from transit or active transportation. In particular, GIG could tap some one-way trips that otherwise might use the much-delayed Ford GoBike system. Nevertheless, GIG’s benefits certainly outweigh the possible downsides once you consider the advantages of potentially lower rates of car ownership. While GIG’s rollout has gone surprisingly well, some enhancements could help it reach its full potential. For GIG, the Homezone boundaries are somewhat arbitrary at times and could better reflect neighborhood boundaries, demand densities, and key destinations. The app generally works well, but it can be difficult to start and end trips where cell service is subpar – while GIG users can carry a separate key card, Bluetooth or Apple Pay functionality could be easier to use. For the cities of Berkeley and Oakland, on-street parking policies still prioritize private cars over GIG in neighborhoods where availability is limited or where a high concentration of one hour zones are located. Extended meter hours, expanded residential parking zones, market rate pricing, and allowing GIG parking in one hour zones could help level the playing field and make GIG even easier to use. Thanks for sharing the promo codes. When I signed up for GIG, I missed one of these. You just saved me $25!